Leading Manufacturer of plate filter press, plate and frame filter press, plate & frame type filter press machine, polypropylene filter press, zero hold up filter press machine and plate frame filter press machine from Thane. Unipack’s Plate & frame type filter press is a sterlisable sheet filter press mosel for clarifying and sterilizing filtration with square model of filter elements. The filter is free standing, the plate pack being completely clear of the ground and is completely encased in stainless steel sheet. 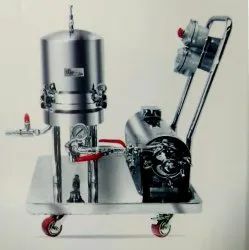 All liquid contact parts AISI SS 316/ SS 316L optionally to meet the customer’s specific requirement, otherwise for filtration of sugar syrup filter press is supplied with AISI 304 including all parts. i.e. liquid contact parts as well as non liquid contact parts. Plate and frame filter press having manual closing system particularly smaller batch size for higher batch size hydraulic closing system is provided which is more user friendly compared with manual closing system. Same filter press which saves costly filter media and food grade silicon washers. Our new feature introduced by using Blockage plate which can be supplied optionally to customer or request. Unipack Filter press manufactures tailor made requirement of customer. Recently we have added new feature in our standard model of filter press. 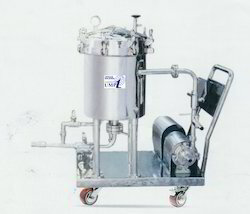 We have introduced new concept in our design so that with the same batch of filtration we have now facility for primary filtration with primaryfiltration with coarse filter media and secondary filtration with fine filter media without stoppage of batch primary and secondary filtration is possible which will save considerable time for completing batch having primary and secondary filtration. To all our esteemed customers on request along with filter media having different specifications. Packaging Details: Unipack Machines delivers its machineries, supplies spares and provides Services withing India as well as on export orders to countries like - UK, USA, Asian Countries & Africa. We are a noteworthy organization in the domain, engaged in providing a high-quality range of Frame Type Filter Press Machine. 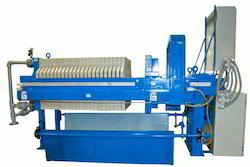 The offered filter press is broadly used in various industries for its durability. This filter press is developed by our team of skillful professionals by utilizing finest quality raw materials and latest technology in accordance with universally accepted standards. Available in diverse technical specifications, we provide this filter press in customized options in order to fulfill the needs of our valued customers. Packaging Details: Unipack Locally transports all its machinery and also exports to various countries like Africa, UK, USA & Asian countries as well. We are leading supplier of Polypropylene Filter Press. We are instrumental in providing our clients a comprehensive range of excellent quality Zero Hold Up Filter Press Machine. Our complete range of filter press is designed with top quality of material in accordance with the market norms. The offered filter press is broadly applauded for its performance long life also examined on quality parameters for ensuring its flawless range. Clientele can purchase the whole range of filter press at pocket-friendly rates. 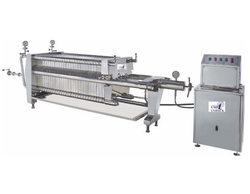 Owing to our rich industry experience, we are offering a wide range of Plate Frame Filter Press Machine. At our developing unit, we design this filter press as per the international standards by making use of best quality basic material and latest technology. The offered filter press is perfectly examined in terms of quality for ensuring their flawlessness. Along with that, customers can avail the complete assortment of filter press at a nominal price. We are leading supplier of Sparkler Filter Press. Looking for Filter Press ?